Decorate Your Walls, Furniture, Fabric, and More. Dimensions: 11 x 11-5/8 in. 12 text pages. 10 die-cut plastic stencils. Storage pocket. Paperback. There's something so satisfying about stenciling: It's easy, affordable, and it yields such impressive results. Especially when all the design work is done for you by the talented textile artist Lotta Jansdotter. 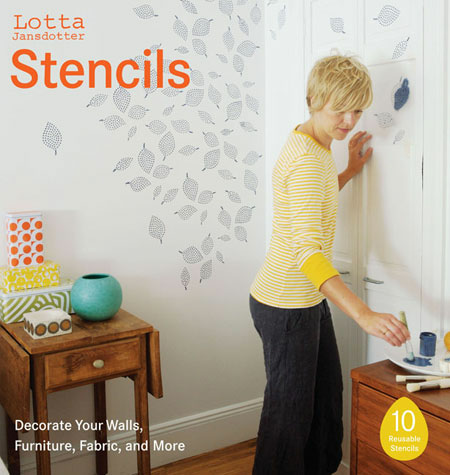 Lotta's hand-drawn stencil motifs are cut out of durable plastic so they can be used again and again on all sorts of surfaces, from walls to fabric to furniture. Simply wipe the stencils clean with soap and water and stow in the handy storage pocket provided. Project instructions and photographs demonstrate how to repeat a design on a structured grid to achieve the look of wallpaper (for a whole lot less money), or apply designs randomly for a unique, playful effect. At just $24.95, this package is a DIY decorator's delight - a real bargain, and beautiful to boot!